There is enormous diversity in the instant coffee industry. The search for the right ingredients for a specific blend can be a long and arduous road, We would love to use our expertise in instant coffee to help you find the right coffee. Whether you are looking for instant cappuccino or other varieties of instant coffee, TB Brown is the place to be. Together we will go through all your needs and wishes in terms of flavour, quality, origin and technical functionality in order to create the right blend for you. Our products are packaged according to your desired specifications. Whether that’s a in a big bag, in a 20kg bulk box or a bag with a specific weight, TB Brown is there for you. Read more about our expertise and know-how of coffee characteristics, our range of coffees and coffee-based drinks. When we think of taste, we quickly think about whether we like or dislike a certain taste. Because this subjective approach to taste is of little use when judging coffee, we assess a coffee’s taste based on four fundamental flavour types: fruitiness, sweetness, bitterness and acidity. Coffee’s aroma is perhaps its most important characteristic. Apart from the small number of typical coffee aromas that anybody will recognize, there are over 800 other scents to distinguish in coffees. Some of the main scent groups are: fruity/floral, caramel, burnt, sweet and smoky aromas. This refers to the texture of the coffee, which can be full- or weak-bodied. Terms such as ‘cloudy’ or ‘smooth’ also refer to the body of your cup of coffee. Although these terms are all abstract, everyone will have a basic idea of what they mean, and everyone will have their own preference when it comes to body. By extending the extraction time or roasting time of the coffee, we can enhance the body of a coffee. A good cappuccino is characterized by a firm, lasting layer of foam. Besides the milk, the coffee is also a contributing factor to this foam layer. 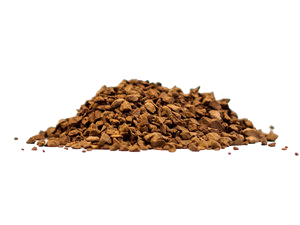 The drying process of the instant coffee is responsible for the foam layer, as the oxygen blown into the granules is freed when they dissolve. The resulting layer of foam adds to the coffee experience and ensures that the coffee’s aromas are retained. 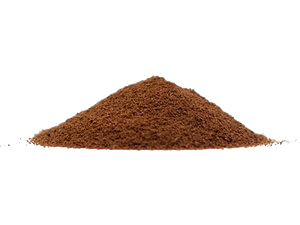 The density of instant coffee is determined by how it was processed. The denser the granules, the less space they occupy. By adjusting the coffee density, we can ensure that it will always fit in your preferred packaging. A cup of coffee is easy to recognize, but, in fact, coffee comes in a whole range of colours. Coffee’s characteristic brown colour can come in an incredible number of different shades. Through various processes we can adjust the coffee’s colour so that it perfectly matches the aroma, taste and experience of the brew. TB Brown’s knowledge and creativity in the field of coffee is proved by our coffee range. From carefully created blends to milk-based coffee drinks and flavoured coffee, TB Brown unites all components of coffee into a single astonishing result. As coffee experts, we know how to combine coffee and milk powder to create high-quality products. The type of milk powder used determines which coffee sensation an instant cappuccino will evoke. A good cappuccino is made with full-fat milk powder, as this guarantees a proper balance between fats and proteins. Full-fat milk goes well with dark and medium-roast Arabica coffees. The warm, rich coffee taste is a true treat for the tongue. Creamer and low-fat milk powder combine well with Robusta coffees, as the milk/creamer give the coffee a pleasantly bitter, yet creamy taste with a unique boost. Blending Arabica and Robusta coffees results in a combination that shares the characteristic features of both varieties. Our coffee expertise has taught us how to use the right blend to highlight the right characteristics in both varietals, allowing us to produce unique coffee varieties with unparalleled taste sensations. Our range also contains a wide variety of flavoured instant coffees. These coffees are made by spraying the coffee granules with fluid flavouring agents. Our favourite flavourings are: Hazelnut & Vanilla, Dark Chocolate, Irish Cream and Cinnamon. By adding these flavourings to specially chosen coffees, we create unique products with carefully selected tastes and aromas. The result: a flavoured coffee that is more than just coffee with a flavour. Below are a few examples of our carefully created coffees that indicate the wide variety of our range. Full-bodied with a pleasant coffee aroma and taste. Produces a very good, long-lasting foam layer.